July 24, 2018 – A lot of folks leap for joy when the temperatures climb into the 80’s or 90’s in the Northwest. I wish I was one of those people! When it gets that hot—especially for days on end—it becomes apparent that I’m definitely a Seattleite. This also tends to be one of those stretches that people shy away from their regular sojourn to the hot tub for a soak. Why head out to a hot tub in the heat?? 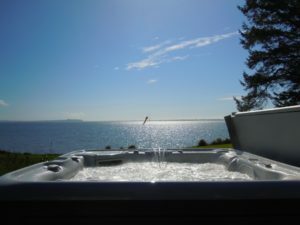 Well, there are ways to make sure your hot tub still provides that terrific retreat without making you break into too much of a sweat. Here are some things to try to keep your hot tub in the mix during hot weather. Lower the temperature of the tub to about 95-98 degrees. Since it will be slightly cooler than body temperature, it will be refreshing and allow you to soak for a decent window of time without issue. If you have a Hot Spring Spa, they’re incredibly well insulated, so it would take a looong time for the tub to cool down. If you turn your tub’s temp down, team that up with adding a couple inches of cold water to the tub from the garden hose to help lower the temperature. If you normally work out or take a run before hot tubbing, give your body’s core temperature a chance to re-regulate to normal body temp before getting into the tub. A quick lukewarm shower prior to entering the tub to ditch excess body sweat and help you cool down is a good idea. Be sure you’re hydrating more than usual when you’re in the tub. Water can absolutely do the trick, but some refreshing lemonade certainly will fill the bill for a summer soak. If you’re looking for liquids that could boost your hydration, you could consider aloe water. Aloe water is packed with antioxidants. It’s also an excellent detoxifying agent for the digestive system and helps stimulate cell growth and encourage wound healing. Coconut water is another terrific option. It’s low in sodium and rich in potassium, which will help your body hydrate in ways water falls short. You can also take purified water and add your favorite refreshing fruits to it. Strawberries, lemons, orange slices and mint all add welcome flavor and taste terrific in warm weather. Before you hit the tub, fill a small container with cool water and ice and soak a few washcloths in it. Take it with you to the tub. When you start to feel the temperature rise too much, wring a cloth out and place it on your forehead as a cool compress. You’ll love it! 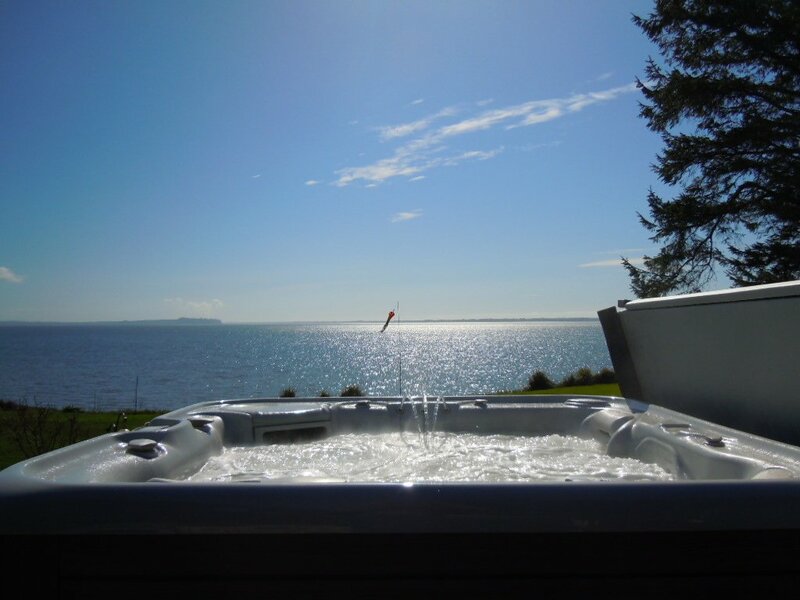 Your hot tub can still be a welcome retreat while the heat is on! Happy soaking!